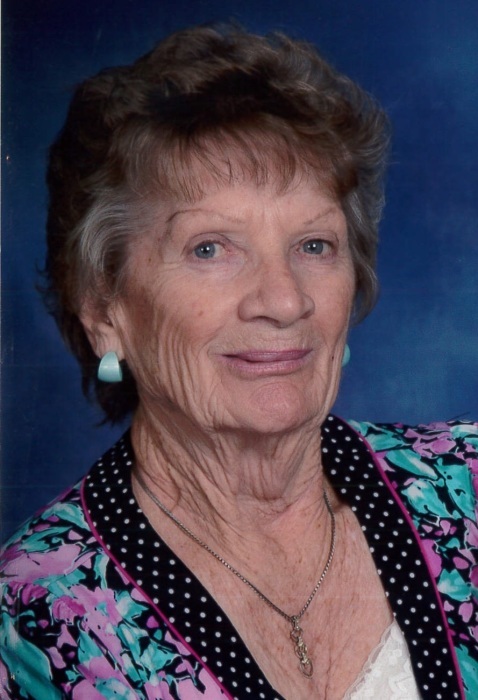 Delores Jean (Eggert) Kuntz, 83, Beatrice passed away Saturday, December 1, 2018, at her home surrounded by family. She was born September 14, 1935 in Beatrice to Fred and Elizabeth (Waltke) Eggert. She was baptized September 29, 1935 at her parent’s home by Rev. J. Kitzelman, and confirmed April 2, 1950 by Rev. John F. Streng. On April 22, 1954 she was united in marriage to Delmar Kuntz, out of this union two children were born, son, Dwight and daughter Kimberly. In 1960 Del and Delores moved to Los Angeles, CA and lived there thirty years where Delores was a Crossing Guard for twelve years and took care of children for several years. In 1989 they retired to Phoenix, AZ and lived there almost 15 years, there Delores worked at the Revlon Cosmetics Factory. In 2002 Del and Delores moved to Belton, MO, moving back to Beatrice in 2004. She enjoyed traveling, garage “Saling”, shopping at thrift stores and her family. Delores was a member of St. John’s Lutheran Church, Beatrice. Survivors include her son, Dwight of Lake Havasu City, AZ; daughter, Kimberly Siems of Beatrice; grandchildren, Jason Siems and wife Samantha, Denise Stege and husband Dion, Eric Kuntz and wife Courtney; great granddaughter, Shaelynn Stege; brother, Donald Eggert of Mesa, AZ; sister-in-law, Laretha Estes of Ontario, CA; brother-in-law, Gilbert Kuntz of CA; several nieces, nephews and cousins. She was preceded in death by her husband, Del; parents, Fred and Elizabeth Eggert; sisters, Anita and Frieda; sisters-in-law, Carol Eggert, Darlene Schmale and Marilyn Rogers; brothers-in-law, Herb Hessheimer, Wayne Mussman and Leo Schmale. Funeral Services will be held 10:30 a.m., Thursday, December 6, 2018 at St. John Lutheran Church, Beatrice with Pastor Leah Lawson officiating. Visitation will be held 9:00 a.m. to 8:00 p.m. Wednesday, Dec. 5 with the family greeting friends from 6:00 to 8:00 p.m. at Harman-Wright Mortuary. Then at the church one hour preceding services. A memorial is established with the mortuary in charge. Inurnment will be in the Evergreen Home at a later date. www.harmanwrightmortuary.com Harman-Wright Mortuary, Beatrice in charge of arrangements.